Supporters of Clapton FC, renowned for their left-wing politics and activity in the local community, are continuing their struggle to take control away from the current owners and turn the East London club into a democratic, fan-owned football club open to the community. 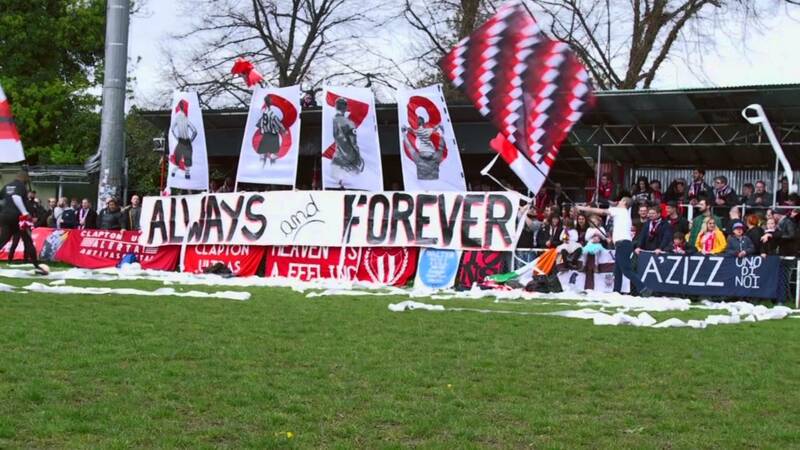 To do this, members of the ‘Real Clapton Football Club’ (made up of fans and reconstituted in 2013) have set up the Clapton Supporters Action Fund and are now only a few hundred pounds away from raising the £10,000 needed to start legal proceedings against ‘Chief Executive’ Vince McBean whose reign supporters have described as being “characterised by gross mismanagement and a lack of transparency”. The situation, however, is becoming increasingly critical for the fans. Back in March, McBean attempted to liquidate Newham Community Leisure Trust (NCL), the charity which runs Clapton FC’s ‘Old Spotted Dog Ground’, with debts of up to £200,000 which he claims are owed to him. Luckily, this liquidation was stayed following a High Court injunction. However, NCL are currently under investigation by the Charity Commission with McBean, who not only acts as the Chief Executive of Clapton FC but also an NCL trustee, facing suspension and possible disqualification from his position. Yet while this is good news for Clapton’s supporters, the club’s future remains uncertain. A new season has started and the club continues to be “structurally unaccountable” argues (Real) Club President, Martin McShea, “controlled by the current regime [and] continues to play in a ground whose future and status is uncertain, with no permission to do so from the appointed liquidator and no transparency over where any gate and bar takings are going to”. Indeed, as fans argue on the club’s website, following a complaint to the Charity Commission that no charitable activity was taking place at the ground, an inquiry was opened in December 2013 and the Charity Commission took control of their bank account. Any other financial transactions that might have taken place therefore go against the control supposed to be exercised by the Charity Commission. However, as fans claim, NCL have no audited accounts since 2003 so it is impossible to know where the money from the rent which Clapton FC (of which McBean is Chief Executive) pay to NCL (of which McBean is a Trustee) is going. In response to this lack of transparency and deep sense of insecurity about their club’s future, Clapton supporters have launched a boycott of their club’s home games and will not be going into the ground for this Saturday’s FA Cup match against Norwich United FC. However, they are also asking that people donate to the Clapton Supporters Action Fund to help them start the expensive and, complicatedly, separate legal proceedings for, firstly, taking control of the club and, secondly, taking control of the ground. “We can work on improving the other facilities for the players like the showers. For the fans we can create an accessible ground for all. “In regards benefits to the community, this is the main driving force for many involved in the Clapton Supporters Fund. We would like to see Clapton firmly embedded in the community. “It would also be great for a women’s team to be playing at the Old Spotted Dog and to see more initiatives from the club to encourage more marginalised groups into the club.